Size: 5.8" x 3.1" x 0.90"
The TI-54 was in 1981 the only calculator dealing with complex numbers. Everything else was known from it's close relative TI-55-II. The calculator was available till the year 1983. The TI-54 makes use of the two chip Master/Slave architecture introduced with the TI-55 II. Find more information about the TP0456 calculator chips here. 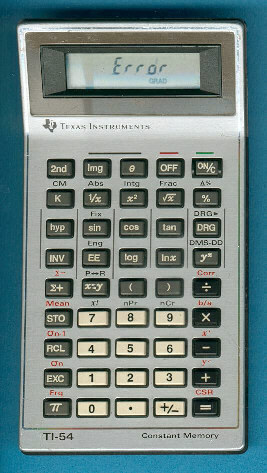 The TI-54 is featured in the Texas Instruments Incorporated leaflet CL-199M dated 1983.